The Mediaplanet Future of Legal campaign, found within USA TODAY and online, brings awareness to the changes the legal industry is facing and what leaders are doing to adapt and prosper. Mediaplanet announced the launch of their first ever edition of "The Future of Legal." This campaign will advocate for changes within the legal industry, impacting education, attorneys, firms, legal services, etc. Highlighting positive shifts in the industry, the campaign gathers knowledge from experts in the field who are adjusting their business practices to thrive in the wake of technological advances and ever-changing client demands. The print component of "Future of Legal" is distributed within USA Today in New York, Los Angeles, Denver, Dallas, Kansas City, St. Louis and Washington DC/Baltimore markets, with a circulation of approximately 250,000 copies and an estimated readership of 750,000. The digital component is distributed nationally, through a vast social media strategy and across a network of top news sites and partner outlets. To explore the digital version of the campaign, click here. Activist Erin Brockovich shines on the cover of the print publication. Through an exclusive interview on the interior, Erin speaks about the relevancy and benefits of legal technology within firms and for attorneys in general. 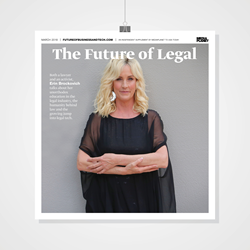 "I think there is more for us to be excited by than there is for us to be fearful of," says Brockovich, explaining her stance on where technology will take law going forward. On the other hand, she warns of losing the human qualities that help lawyers connect to their clients. "There's nothing like human interaction. I don't think technology can replace that." Erin Brockovich advocates for consumers and dedicates her legal practices to helping our world and the future of our environment. This campaign was made possible with the support of the National Society of Legal Technology, the National Consumer Law Center, BQE Systems, Everlaw, Clio, the University of Nebraska Lincoln College of Law, Seton Hall University School of Law and Vonage.